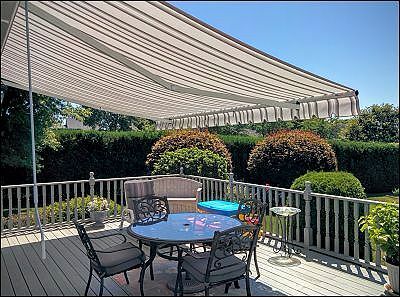 A retractable canvas awning will provide shade when you want it and roll in when you want some sun. 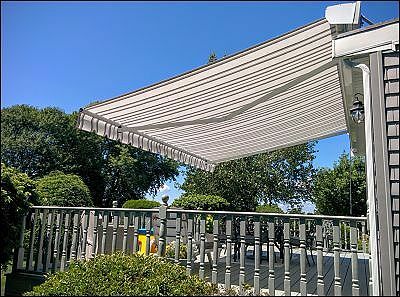 A retractable awning can be a great way to provide shade for your deck or patio. They are measured to fit just about any size deck and mount to just about any surface. For someone who doesn’t want a permanent frame attached to their deck, a retractable awning can be just the solution. The way the sun beat down on this exposed deck was brutal and rendered the space useless. 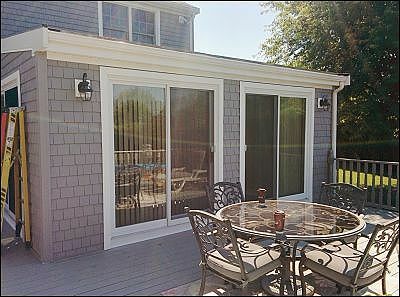 After the awning was installed (this one was roof mounted), not only could these homeowners get some much needed shade on the deck, but on the sliding patio doors too. Now inside, they can open the blinds to get just the right amount of natural light without the sun raising the temperature of the living room. Side view of the installed awning.